Looters Prowl For What The Twister Left In Joplin Many residents lost nearly all their possessions when Sunday's monster tornado ripped apart the town. While the losses due to looting have been relatively small, they aggravate some people almost as much as the storm. 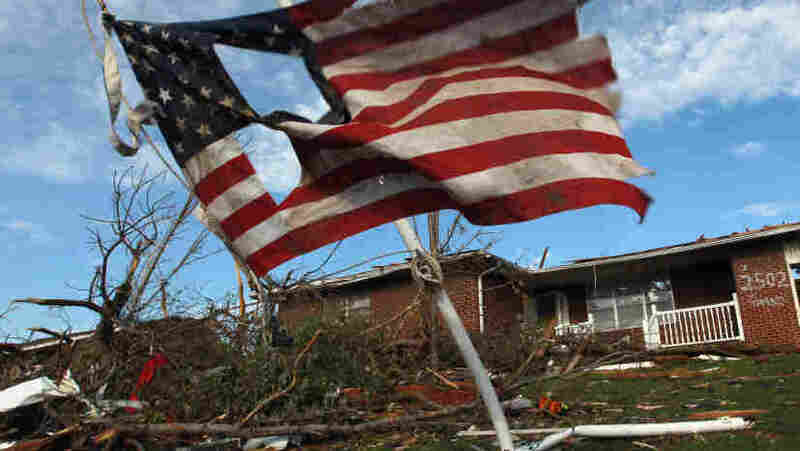 A torn U.S. flag hangs outside a house damaged during Sunday's massive tornado in Joplin, Mo. As of Thursday, local police said they had arrested 16 people for looting and burglary and four for assault since the twister hit. The death toll from the devastating tornado in Joplin, Mo., rose to 132 on Friday as survivors tried to pick up the pieces of shattered lives and homes amid concerns about looting and fraud. Two children who may have been related, one 17 months old and the other 5 years old, were among the newly confirmed dead. Some names have been added and others taken off a list of the missing, which stood at 156. Some people lost family members, and for somebody to just [come in] and take stuff, I mean, that's just wrong. Officials said that while some people on the list were likely among the dead, many people may simply be unaccounted for, perhaps having fled the area or been taken to hospitals outside the city. Joplin has borne the brunt of the severe weather that has pulverized parts of the nation's midsection in recent days. Powerful storms left three people dead in the Atlanta area on Thursday, while 16 people died earlier in the week during storms that raked Oklahoma, Arkansas and Kansas. In Joplin, residents said looters have been picking through the rubble, hoping to grab what little is left from people who have lost nearly everything. Compared with the staggering destruction wreaked by the tornado — the deadliest to hit the U.S. in nearly 65 years — the losses due to looting have been small, police said. But they aggravate some people almost as much as the storm. The night of the tornado, as emergency responders rushed from one shattered home to the next, Steve Dixon sat outside his father's destroyed house with a baseball bat. "They wouldn't see me sitting here in my chair, I was in the dark," he told NPR. "I'd turn my bright spotlight on them and tell them they needed to move on. Then when the police came by, I'd tell them which way they went." Dixon's is one of many similar stories. The day after the twister, Claud McDowell said he was taking stock of what remained of his roofing business when he ran off someone stealing wire out of a house "to melt it down after for the copper." "We were really furious about that," McDowell said. "He's lucky he got out of here in one piece." Lori Grier was at the Joplin police station to report that her truck had been stolen. She said she went back to her destroyed house on Tuesday morning and insisted her truck was there when she left. Now it's gone. "An act of God you can't control, but then to have somebody who is low enough — scum — come in and victimize us," she said, her voice barely containing her anger. "Some people lost family members, and for somebody to just [come in] and take stuff, I mean, that's just wrong." As of midday Thursday, Joplin police had arrested 16 people for looting and burglary and four for assault since the tornado hit. But they said crime has been relatively limited. There are hundreds of officers from four states patrolling the area as well as National Guard troops who have imposed a 9 p.m. curfew. Thousands of volunteers from churches, schools and lodges from across several states were filling the streets of Joplin offering food, medical aid and cleanup help. But not all of the offers are legitimate, according to Missouri's attorney general, Chris Koster. "In the wake of the heart-wrenching devastation of the Joplin tornado and southeast Missouri flooding will come the scam artists," Koster said on his website. "They come to those who are experiencing anguish and shock because where most see cause for charity and sympathy, they see opportunity for financial gain." The state said it is on the lookout for price gouging on gas and building materials, phony charities and contractors who offer to do work but demand pay upfront. Joplin's half-mile-wide twister took out the city's main hospital, the high school and possibly thousands of homes. The Walmart was flattened, along with the Home Depot. Hundreds of businesses and industrial buildings were lost. And an untold number of vehicles — from cars to tractor-trailers, even the hospital helicopter — were mangled. City Manager Mark Rohr said planners are already plotting a comeback, vowing that Joplin "will recover stronger than when we began." President Obama, who is expected to visit Joplin on Saturday, has declared disasters in Jasper and Newton counties, and a key House panel has approved a $1 billion aid package to make sure federal disaster-relief accounts don't run out before the end of the budget year in September. "I wouldn't consider this an economic-development opportunity. This is just survival," Richard said. "We're just going to have to get back to where we were — as close as we can would be the goal. I'm not sure how much time it's going to take."